Dubai, UAE, May 27, 2018: The groups have been drawn for the season-ending ATCO PSA Dubai World Series Finals, and squash fans in Dubai are in for a treat with sensational clashes in store when play gets underway at the Emirates Golf Club from June 5-9. The lucrative tournament - which offers an equal prize purse of $320,000 across the men’s and women’s events - brings together the top eight men and women on the PSA World Series Standings, with players earning qualification points at each World Series event contested during the 2017/18 season. The event, which is supported by the Dubai Sports Council, will see players will face-off against each other in a round-robin best-of-three game series between June 5-7 with only two players progressing from each group of four to the semi-finals on June 8, before the finals are played on June 9. In men’s Group A, 2018 Allam British Open champion Miguel Angel Rodriguez is drawn with the man he beat in the final of that tournament last week - Egypt’s World No.1 Mohamed ElShorbagy. 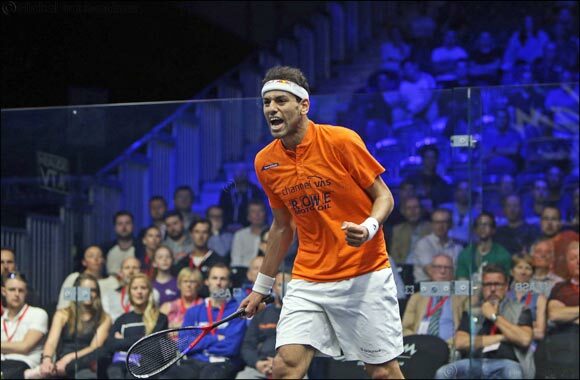 Rodriguez’s heroics at the British Open saw him oust three-time World Champion Nick Matthew to earn his place in Dubai for a second time in three years, while he also became the first South American player ever to win a World Series title after overcoming defending World Series Finals champion ElShorbagy in a thrilling 102-minute battle. There promises to be plenty of drama in the women’s event too, with last year’s runner-up Nour El Sherbini, the current World No.1, drawn together with World No.3 Nour El Tayeb - who won the U.S. Open in October - Windy City Open runner-up and 2018 Commonwealth Games gold medallist Joelle King and World No.5 Nouran Gohar in Group A. The finals will commence at 8:00pm on June 9.